They’re taking over some cities and towns, intra- and extra-murally. There’s a bit of a Blue light special. Don’t get me wrong’ I generally like’me. Technical: I inductively started, practically finished, and penultimately exported as a jpeg the main drawing in Tayasui Sketches. Then I imported it three times on three different layers into Sketch Club, transforming it twice for placement on the opposing walls. In Sketch Club it’s pretty easy to “transform” images without much interference in positioning. I accommodated the layers in Sketch Club by erasing here and smudging there. Then, finally, I sharpened the exported composite image in iColorama. 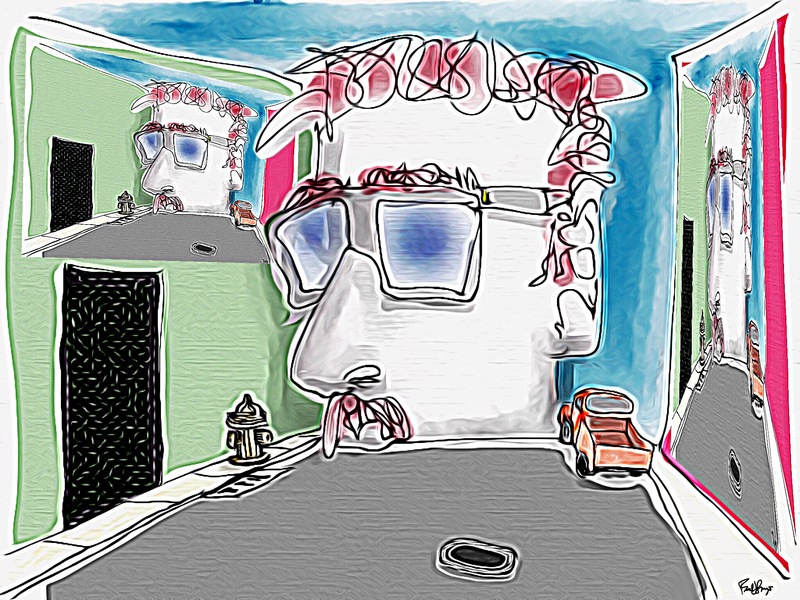 This entry was posted in Digital Artwork, iPad Art, Sketches and tagged extramural, iColorama, murals, Public Art, Sketch Club, Tayasui Sketches by portfoliolongo.com. Bookmark the permalink.